So…Where do I begin? What a beautiful adventure we have begun! 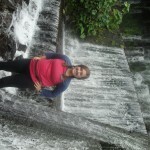 I am now in one of the biggest areas in the mission, Tazumal! It is part of Ciudad Real, on the outskirts of a bigger city called Chalchuapa. It is really, really, really big, and really, really, really hot! Most of our area is residential. We live in a maze of gated communities, cars, two story houses, and a drastic difference from the humble cobbled streets of Juayua. But even though the area is wealthier, there are so many people prepared who let us in to share the message of the gospel with them. My new companion is Hermana Reyes. 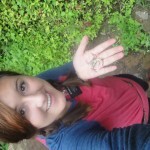 She is from the Dominican Republic and she has almost five months in the mission. She is fabulous! 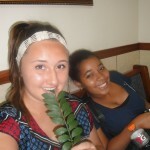 We are always joking around, and she is learning English! Since the first moment that they put us together I have never stopped feeling the spirit, and I am excited to see what the Lord has in store for our team! Love my companion so much! 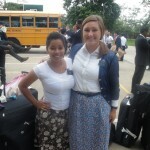 Hermana Reyes is amazing! She has such a desire to work and is super animated! I feel like she is training me. Our lessons are fluid and powerful, as if we have had months teaching together. I am excited to see what the Lord has in store for us. There is just one minor detail, we are opening our area! Yep, we were dropped off at our house, they handed us a mass of keys and said, and “One of these is yours, right around the corner in the blue house lives a member. Have fun!” We had no area book, no microwave, no stove, no food, and for the first two days our phone did not work! It was really fun! Opening an area is filled with so many adventures and things that I was not expecting. The first night, we could not find our house and I almost accidentally broke into the neighbor’s house….. Oops! When we finally found our house I had to jimmy rig the door open because the door was rusty. No worries, all is well now, we can only laugh and keep on keeping on. Our theme is “Don’t worry, be happy!” But really though, there is something beautiful about literally “losing yourself” in the Lords work. I feel that our area is a giant sheet of blank paper and the Lord has handed us the pencil. We have hit the ground running, there is so much potential here, So many people have been prepared to receive the gospel, and the ward is more than willing to reach out and help us. The ward is gigantic! We are trying our hardest to get to know this giant area as fast as we can so that we can use our time the most efficiently. I love you all! Thank you for everything you do!